OOC will not result in a record. you must attend whatever you do. but now you've pontificated for yet another day, and its the W/end you cant do anything till Monday now..another 2 days lost. I plan to call TFL tomorrow, or on Tuesday if I feel like I'm not prepared enough tomorrow. I will attempt to settle out of court. I'm not sure what to say honestly. I'm assuming I'd have to be very brief and get straight to the point, but it's difficult to properly explain this situation from my side whilst also making it brief. I've explained this situation to my father and he has encouraged me to plead not guilty. He says I've been s c a m m e d, since I paid for an application to be made for a student 16+ oyster card, but yet I received an invalid one which is not what I thought I will be getting. Why do you advice pleading guilty? (If it does come to court). Hopefully everything can be settled OOC and even if I have to pay that fine + application, at least I won't have a record and I can take this as a lesson rather than something that will actually affect me. you did not receive an invalid card ..it was FAKE card..
regardless to the fact you unwittingly used a social media link to a provider of fake cards you are still guilty for travelling on that fake card. last time i'll say it. do not plead not guilty follow post 8.
also where is page 2 of the TfL letter? I thank you for helping me and giving me guidance, but I haven't received any advice for what to say when I actually call TFL and try to settle out of court. I just want to know how I should approach the subject when I call them and what parts of my story I should say. Well, you don't have to tell them anything they don't know already when you speak to them. We normally advise people to show remorse [if you feel remorse], promise never to do this again and explain why the court case could adversely affect your future. And you ask if they will allow you to reach an administrative solution to this, pay their costs and the missing fares. Something like that. I think the only point to make to them is that you used what you now realise was an advert for a fake oyster card as you had trouble registering on the TfL site and thought this advert did the admin for you. It seems like forum will be going down soon for at least 2 days. I want to contact TFL today. I was wondering what number I should call to discuss OOC? cant you use a phone book or google it? next you'll want us to ring up for you. CAG is self help too!! I called up TfL on Wednesday and asked about settling out of court. They said I will need to email them about it so I did that on the same day. Today I sent off the court letter to court with my plea. I was never given a letter asking for my side of the story though, some users here said that I should've received one prior to the court letter but I never did. I emailed TfL briefly explaining my story, apologising and asking for settling out of court. Sent the email 7 days before the actual court date, but my father said that if they do want an out of court settlement then they can always cancel the court even after I sent my letter with the plea. I'm not sure what my chances are for OOC. To be honest I think they won't accept it just from my gut feeling, hopefully I'm wrong though. I'd rather have a confirmation that the case will settled out of court, get drunk and put this all behind me. But this may just turn out to be a very stressful year for me. 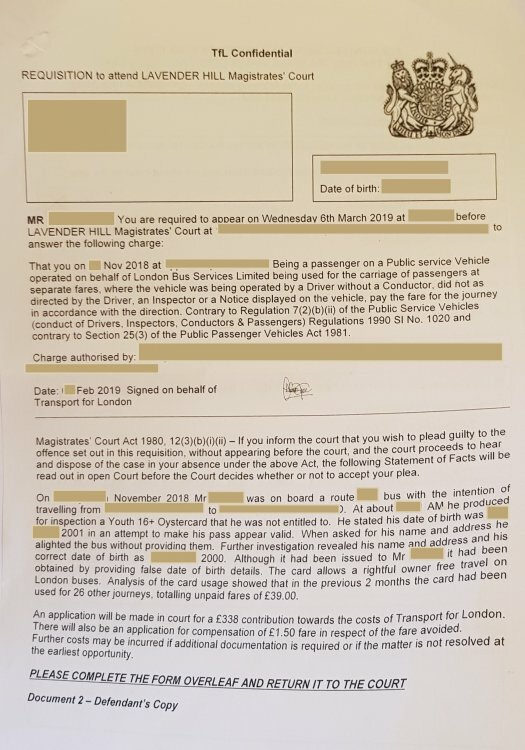 Well TfL said they don't settle out of court, and said that if I didn't know that the oyster card was not valid then I wouldn't have provided wrong date of birth and alighted the bus. I didn't respond to that, but I never alighted the bus and that's what I thought the date of birth would be on their side of the system. Well my dad has said that they are accusing me of this, even saying that i alighted the bus to avoid providing details, but this is not true. I sent off a not guilty plead to the court and I believe they will reschedule a new date. I am waiting for the new date. Honestly, I don't know how it's looking for me. So we are wasting our time then.? And never were going to. From the start of this thread you've expressed your annoyance about helping me. Constantly saying how everything I'm doing is wrong. I was accused something which I DIDNT DO. My father who is familiar with the law has also noticed that and has advised me to plead not guilty. I made this thread because I knew taking in other opinions and advice will be helpful to me, but I will obviously have my father as my main adviser in this situation. And now you're acting like the victim because I decided to take my father's advice in a situation where I'm being accused of something I did not do? I was always listening, taking in every piece of advice I could and keeping that in mind. You've showed how much of a burden it was for you to help me and give me advice and you think I will do 100% as you say even when my FATHER advises me against it? In court you will be asked one simple question and your answer will need to be yes or no. On the day you were stopped, did you produce a valid ticket? Answer will inevitably be NO. So pleading not guilty is the wrong move, will make tfl more determined to avoid an ooc settlement. Also, if the inspector wrote that you alighted the bus without disclosing your name and address and they had to dig it out via other means, i tempt to believe it. There's no incentive for the inspector to lie, especially because finding your name and address from different databases costs time and money and makes the admin part of the job a lot longer. Dx tried to help you and you didn't listen. Your dad wants to help you but my gut feeling is that you haven't told him the whole truth. You obtained a discount card knowing that you were not entitled to it. In fact you knew that when stopped you had to give a false date of birth. You used the card on many occasions and when finally caught, you first gave false date of birth, then run away from the inspector because you knew you were in trouble. Now, wake up and smell the coffee: tfl could have sent the police to your place to arrest you, in fact failing to disclose name and address when stopped on suspicion of fare evasion is an arrestable offence. You should be glad they probably thought you run away because you panicked. So, stop trying to convince us and yourself that you are an innocent party and take responsibility for what happened. Tell the whole truth to your father because he will find out in court when you'll be faced with inconfutable evidence and he will not be impressed. What, (since 2006) is the difference between an arrestable and non-arrestable offence? You give the police your (verifiable) name and address. Please stop spouting tosh. The police asren't going to visit the OP, and aren't going to arrest them. Not anymore because tfl decided to be lenient. Btp would love to tick boxes by visiting people at home, even if it is only to confirm their details. As the op run away, the inspector found the details from the original registration i guess, but the op could have been someone else using that card, maybe a sibling with similar face features so not to be instantly obvious that it wasn't their card. Police won't attend now because op identity has been assessed, but tfl could have reported this matter to btp. I was wrong to say "to arrest you", but surely there are grounds to be visited to confirm details. A lot of times this leads to an invitation to the police station and possibly a caution being issued. This is an easy tick on police books that is more and more frequent. So as said, i think tfl was quite lenient in this case. They could have caused a lot more trouble. For 2 wrong words i beg to differ that i am spouting tosh as bazzas said. Being visited by police is very much a possibility if you run away without disclosing personal details after committing an offence. Maybe not being arrested, but please bazzas, do not make it sound like it's ok to commit an offence and run away. Think about the idiots who shoplift and on the same visit they buy something cheap on their credit card. Once identity of credit card holder is revealed, being visited by police is a very real possibility, same as fare evasion. You’ll note that I never said it is OK to commit an offence and run away, so cease & desist from putting words in my mouth to try & distract people from your errors and trying to tell people “the police will come round and arrest you” when they won’t. The police might come round if the person’s ID was still in doubt, (but that isn’t the case here). The police might arrest someone if offence(s) still needing investigating : but that isn’t the case here, either. Stop trying to dress up your “arrestable offence“ mistake (and trying to scare the OP) as “its not OK to commit an offence and run away”. Clearly it isn’t ok to do that, but the OP says that’s not what happened, and no one is going to come round & arrest them. "I was﻿﻿﻿﻿﻿﻿﻿ wrong﻿﻿﻿﻿﻿﻿﻿﻿ to s﻿ay "to arrest y﻿ou"﻿﻿"
I admitted of being wrong, i am old enough to do so, clearly you're not as you enjoy your teenage self confidence in kicking people. "please bazzas, do﻿﻿﻿ not make it sound like it's ok to commit an offence and run away" this means that what you said sounded wrong even if you didn't mean it, but you cannot be wrong or even misunderstood of course. I repeated many times that "Police﻿ wo﻿n't attend now﻿", but you decided to keep axing and chopping. I thought better of you, but i was wrong. So, where did I say it’s OK to commit an offence and run away? Or where could I have been misunderstood to have said that. Quote where, if you believe that’s what I said. since I didn’t, why are you repeating it? More deflection tactics from your error(s), even though you say you’ll ‘fess up when wrong. BTP have more pressing matters than going round to the home of an (isolated case) possible fare evader whose details TFL believe they have found. That’s why TFL send out the letter they do, and why BTP won’t be pitching up at the OP’s address. It isn’t a case of “won’t be going round now”, but “never were going to”! Let someone you know read your post #41 and see if it can be misinterpreted. Anyhow, i now know that you like being told you're right and never being contradicted or even slightly criticised, so no point having this conversation. Be brave. Point out where my post #41 is open to misinterpretation. Let people decide if I’ve been open to misinterpretation or you just can’t interpret, if you are still saying it was unclear. Saying “ohh, post 41” isn’t being clear as to how I could have left it open to misinterpretation. Be brave. Commit, instead of further obfuscation. It's the all post, starting with links and ending with abuse, could sound like it's general advice for any offender: once you've run away, you're clear with the police, same as the op. Difficult to understand, i know, but once you start dealing with criminals, especially petty once, you realise they can easily misinterpret sentences that nobel price scientists find obvious, clear cut and unmistakable. You're lucky to be in the 1% of population with superior intelligence, but many people like me have very few neurons firing, hence the possible confusion. I don’t believe that “criminal = stupid / cant understand posts”, nor do I believe the OP set out to commit a criminal act (hence why they should try to persuade TFL not to prosecute, by “I was naive, not deliberately criminal”). I can’t do anything about your recurrent ability to misunderstand posts, and all I can do when you post poor advice or out and out rubbish, is to try to correct it so OP’s only worry about what they need to be concerned of. This is an anonymous forum, and I have absolutely NOTHING here that can prove who I am. It hurts me to see that nobody seems to believe that I really didn't alight the bus. What would I gain from lying on here? The bus was approaching my stop, the inspector asked for my date of birth but NEVER asked for my name or address. After he asked those questions, I even told him that it's my stop and that I'll be getting off - the inspector nodded his head and let me get off casually. I got off the bus with absolutely no rush at all and the inspector was PERFECTLY fine with me getting off after nodding his head saying that I can. Did I produce a valid ticket? Well I DID have an oyster card which I believed to be valid. Only when I received the letter did I realise that the account which was made for me was provided with the incorrect details. I don't know whether pleading not guilty was the correct move or the wrong move. I am an 18 year old who has never had any trouble with the law OR any experience with it. But my father advised me to do this after I told him what happened and so I decided to trust him. Now I'd like to think that I'm not a stupid person, at least for my age. But I do know that I definitely made a mistake. So at the very least I would just like to ask for this advice. If you could just assume that I am telling the truth here. I never was asked for my name and address. I also gave the date of birth which the person on social media told me will be on the system in order for my card to be valid. How will the court handle this situation anyway? From the very start, I've been worried that it's my word against the ticket inspector. My word is taken even less seriously because I'm at fault for making this mistake. But I really am being truthful. - If I was asked any question I would have certainly provided the answer but I WASN'T asked for my name/address. When I first received this summon, I wasn't that worried about it. That's because I know for myself that I was unaware that I wasn't allowed to have the card I was using, I was eligible for ALL of the discounts on the card anyway so why would I get it illegally? And I thought if I just explain my side of the story it would be fine. But now I realise that although I know that I'm being truthful, I have no evidence other than my own word which has put me in this situation. So if you are still here to give me advice for this: what do you recommend I do? Is it looking bad for me even if I am telling the truth?